Even if it’s currently cold concrete and crammed with boxes of off-season duds, the lowest floor of your home probably has loads of potential. Treat it just as you would any of the rooms above ground, and it might just become the most popular spot in the house — for a lot less cash than adding on. Here’s our bottom-line advice for turning this underutilized space into a place you’ll be eager to spend time in. 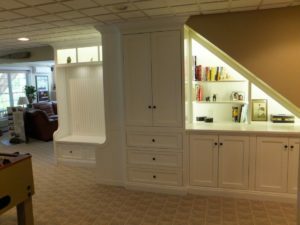 Finishing the basement allows you the rare opportunity to design a room from the ground up. Working with that much flexibility can often feel overwhelming, especially if you’re dealing with it for the first time. Use these tips as a guide to create a bonus space that works for your family. Remember that even though you’ll be taking your basement to the next level, it still needs to be a highly utilitarian area. Whether you currently use the space for storage, laundry facilities, a home office or some combination of all three, you want your new design to enhance that functionality rather than take away from it. Wall off any areas that need extra privacy. Leave the area around your water heater unfinished in case of leaks. Keep your plumbing in place whenever possible to cut down on cost. Before you get started on your project, think about all the ways you’re hoping to use your new space. Maybe you’ve been thinking about adding a guest bedroom, another powder room, or maybe you want to add a gym, laundry room, bar, or TV room. Unless you have a true background in construction, this is one area where we truly recommend hiring a contractor. Make sure the team you hire has the skills to take on your unique vision. Select someone who is familiar with the permitting and zoning regulations in your municipality and, if possible, bring in specialists to handle any necessary plumbing and electrical work. Check for any water issues in your basement before beginning the planning process. Obvious signs are pools of water or drips coming through the below-grade walls. Check outside to make sure the ground is graded away from your foundation. Also, look for cracks in your foundation walls and repair that damage, if necessary. Finishing a basement is different from any other design project. Because, in this case, you’re starting from scratch. While that does give you more freedom to customize the space as you see fit, there’s also more legwork to be done in the beginning to ensure it stays warm and dry. No one wants to see their hard work dampened by an errant rainstorm or frigid temperatures. Have some sort of open concept arrangement. Maybe you want an extra kitchen area, bar, a laundry room, or a gym. Regardless of which grouping you want, ground it with its own light fixture and maybe an area rug. Be sure to have space between each segment. It will also help separate these areas so they do not seem visually overwhelming. But, keep the open concept. For many years, the basement consisted of bare walls and mismatched furniture. No Longer. When you’re going to spend the time, energy, and money to finish your basement, you should treat it like any other space in your house. Color and accessories that match your furniture choice will make your new basement welcoming and cozy.